The headquarters of the United Nations is a complex in New York City designed by Brazilian architect Oscar Niemeyer. The complex has served as the official headquarters of the United Nations since its completion in 1952. It is located in the Turtle Bay neighbourhood of Manhattan, on spacious grounds overlooking the East River. 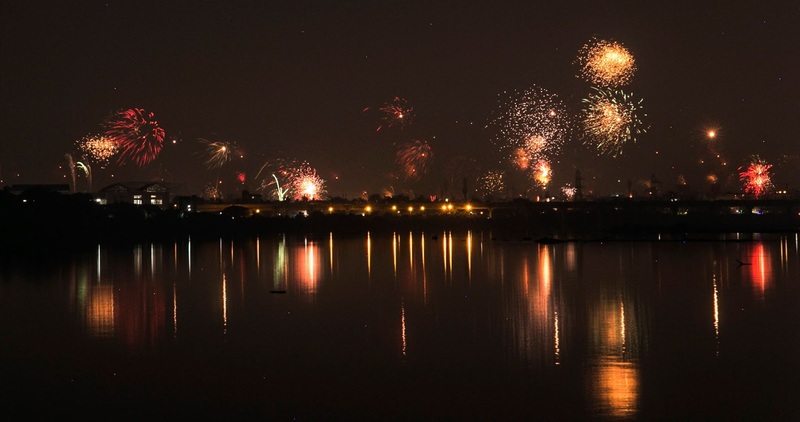 Deepavali, the festival of lights was celebrated in a grandeur manner across the country. People wore new clothes, burst crackers, distributed sweets, visited relatives and received the blessings of elders. It was indeed all happiness and dispelling evils. Here is a photo of Deepavali captured by a friend (Mrs Sripriya Ayyangar) – at Thiruvallikkeni, Deepavali is double happiness as our Acharyar Swami Manavala Mamunigal Uthsavam is on. More on that on my other blog. Prime Minister of the Nation made it more memorable. Our Prime Minister Shri Narendra Modiji visited Sumdo near the India-China border, in Kinnaur district of Himachal Pradesh, to celebrate Diwali with the jawans. 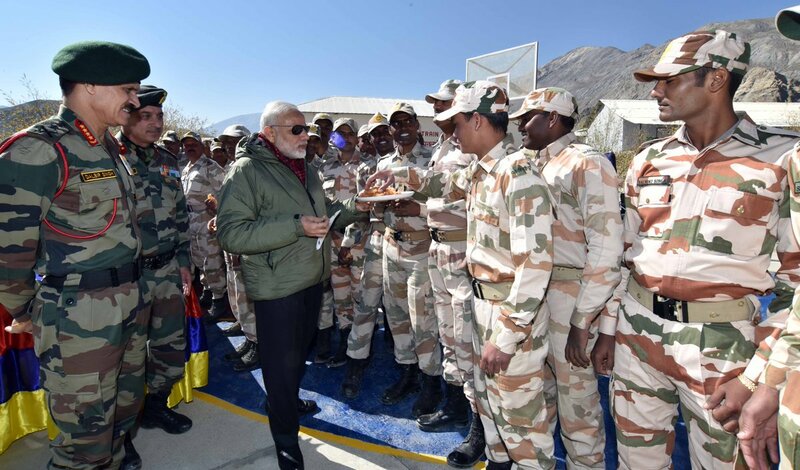 He interacted with jawans from the ITBP and the Indian Army, and offered sweets to them. Addressing the jawans, he said he had been visiting armed forces personnel every year on Diwali since 2001. He mentioned the tremendous response from people across the country, to his appeal for sending messages to soldiers as part of the #Sandesh2Soldiers campaign. The Prime Minister said that giving One Rank One Pension to ex-servicemen was a promise that he had made, and he was happy that he had been able to fulfil it. The Chief of Army Staff, Gen. Dalbir Singh, was present on the occasion. While returning from Sumdo, the Prime Minister halted briefly at a nearby village - Chango. He exchanged Diwali greetings, interacted with the people there, and offered sweets to children. At a time of tension prevailing on the border, Modiji on Sunday saluted the valour of the armed forces and lauded their sacrifice while dedicating the festival of Diwali to them. "From last few months our jawans (soldiers) are sacrificing their lives, we should celebrate this Diwali in their name," Modi said while speaking on Mann Ki Baat, his monthly radio address. Modi also applauded Indian soldiers for their undying love and sacrifice for the country and said that this Diwali dedicated to them. "Every citizen of the country is proud of our soldiers," he said. Responding to his call - people from walks of life sent messages of love and encouragement for our jawans (soldiers), just as they light candles for their well-being. Our forces endure grave hardships for our security. Someone is stationed in a desert, someone on the Himalayas, someone is guarding our industrial installations and someone is protecting our airports. Everyone is fulfilling a mighty responsibility. If we remember them while being in a festive mood, our remembrance will give them strength and renewed energy. I thank everyone for responding to Sandesh2Soldiers," Modi said in over half-an-hour address on the occasion of Diwali. Modi also urged all citizens and state governments to find ways of forging unity across the country and working to defeat separatist tendencies and mentalities. More than 10 lakh messages have arrived for soldiers from across the nation. Modi also urged people to mark Sardar Vallabhbhai Patel's birth anniversary and remembered the anti-Sikh riots of 1984. Diwali was commemorated for the first time at the United Nations, with the world body's imposing headquarters lit up especially on the occasion of the Indian festival of lights. The facade of the UN headquarters was lit in bright hues and the words 'Happy Diwali', along with the image of a traditional 'diya', projected onto the building. "Lighting up. @UN lights up for #Diwali for 1st time," India's Ambassador to the UN Syed Akbaruddin tweeted. "Happy Diwali! @UN celebrates Diwali for 1st time. Thank you @UN_PGA for this initiative," said another tweet, thanking General Assembly President Peter Thomson for the initiative. Thomson also tweeted a picture of the UN building lit up in bright blue for Diwali and said "Light over darkness, hope over despair, knowledge over ignorance, good over evil - the UN lights up. Happy Diwali!" The UN Secretariat building will be lit up for Diwali from 29-31 October. It is for the first time that the Indian festival of lights is celebrated at the world body after the UN General Assembly adopted a resolution in December, 2014 that acknowledged the "significance of Diwali". Noting that the festival is observed in many UN member states, the resolution had called on UN bodies to avoid holding meetings on Diwali, declaring it a no-meeting day. From 2016 onwards, Diwali was made an optional holiday for the UN, India's Permanent Mission to the world body said in a special video message. Earlier in June, the UN building was lit up on the occasion of the International Yoga Day, with images of Yoga postures projected on the imposing headquarters.